If we are going to move the Gospel of Mark to the second century . . . . When we settle on a date for the composition of the Gospel of Mark soon after 70 CE and the destruction of the Temple by the armies of Vespasian and Titus, then it is only natural that we will want to study the lives and times of Vespasian and Titus. Perhaps the most significant political development that formed the backdrop of the generation that was the first to hear and reflect upon the Gospel of Mark was the dynamic thrust of Vespasian’s propaganda machine to demonstrate to the world that he was the rightful new emperor (burying in the hype the uncomfortable fact of his lowly and foreign origins), and a major plank of his propaganda efforts was the building up of the conquest of Judea into a major victory against a significant eastern threat to the empire. Against such a backdrop our understanding of the Gospel of Mark as a counter–imperial narrative, and our interpretation of the procession of Jesus to the cross as a mock-triumph. If we prefer to see the Gospel being written at a time of persecutions, or at least fear and threat of persecution, then we may wish to place it in the 90s when and where some see the introduction of the Jewish synagogue curse being directed at Christians and where we may further see Domitian’s revival of the imperial cult. But if we are toying with placing the Gospel in the second century, what we focus on then will depend how far into the second century we are prepared to go. We may prefer to opt for a date closer to the mid century, let’s say later 130s or around 140s, if we think the “Little Apocalypse” of Mark 13 makes best sense as a reference to Hadrian’s efforts to set up a pagan temple complete with statue of Jupiter on the site of the old Jewish temple and to Bar Kochba’s “messianic” war supported by the rabbi Akiba. If we are going to explore where different threads end up by placing the gospel so “late” then another background worth studying is Hadrian’s rule more generally. Hadrian was renowned for more than crushing the the Bar Kochba rebellion. 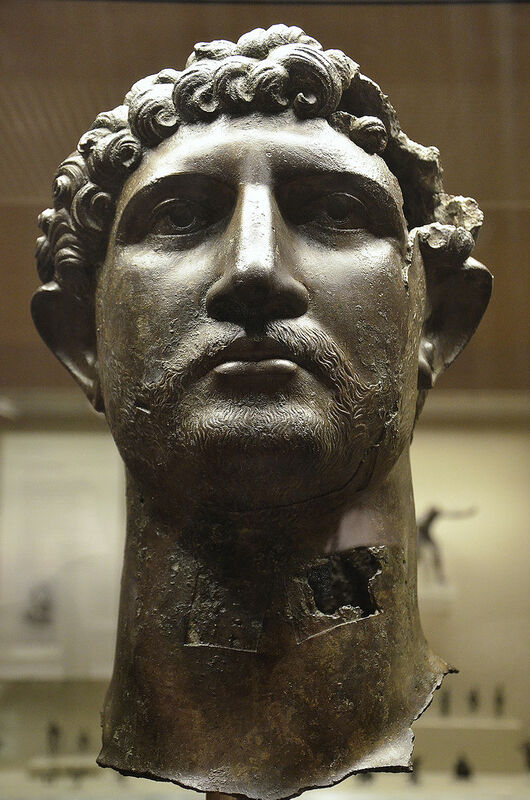 More generally Hadrian promoted himself as a restorer and even second founder of the Roman empire itself. In the beginning of his reign he promoted himself as the god Mars and then in the later years he presented himself (through coins, for example) as the new Romulus, founder of the original Rome. Romulus was also believed to have been the son of the god Mars. Hadrian loved to travel, but he was doing more than site-seeing. He was presenting himself as a second founder of major cities such as Athens. Temples and monuments and processions and such pomp drove home his message about both himself and what he was doing in his restoring of the Empire and the Pax Romana. The imperial cult became especially important. People were expected to turn up and demonstrate their piety when his image was entering a city. When he entered a city or a temple he did so as a god manifesting himself to his subjects. He even identified himself with Jupiter himself, the head god of the pantheon. As Jupiter ruled Olympus, so the emperor, an embodiment of Jupiter, ruled the “world”. We can look for the time period where we find the most bits of the puzzle seeming to fit and settle on that for the date of the earliest gospel. But such a method will always remain open to question. We need to do more than simply look for pieces that fit, or more likely look for ways to fit as many pieces as possible. Remember our ever-present bane of confirmation bias.